While the bread machine mixes, kneads, and lets the dough rise, you can stir up the cranberry filling--and put out holiday decorations. Add first 8 ingredients to the bread machine pan according to manufacturer's directions. Select the dough cycle. When the cycle is complete, remove dough from machine. Punch down. Cover and let rest for 10 minutes. Meanwhile, in a small mixing bowl stir together cranberries, brown sugar, pecans, orange peel, and allspice. Divide dough in half. On a lightly floured surface, roll each half into a 12x8-inch rectangle. 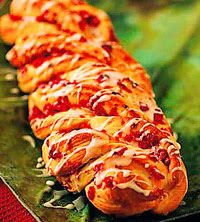 Brush each with melted margarine or butter and sprinkle with half of the cranberry mixture. Starting from a long side, roll up into a spiral; seal edge. Place on a greased baking sheet. Cut roll in half lengthwise; turn cut sides up. Loosely weave halves together, keeping cut sides up. Press ends together. Cover and let rise in a warm place about 30 minutes or until nearly double. Bake in a 375 degree F oven for 25 minutes. If necessary, loosely cover with foil the last 10 minutes to prevent overbrowning. Remove from baking sheet; cool on a wire rack. In a small mixing bowl stir together powdered sugar and enough orange juice (1 to 3 teaspoons) to make a glaze of drizzling consistency. Drizzle over loaves. Makes 2 loaves (24 servings). Bake and cool bread. Do not drizzle with glaze. Wrap in foil and place in a large plastic freezer bag or freezer container. Seal, label, and freeze up to 1 month. Thaw overnight in refrigerator or for 2 hours at room temperature. Place foil-wrapped frozen bread in a 300 degree F oven for 25 minutes or just until warm. Serve as above. Calories 138, Total Fat 3 g, Saturated Fat 1 g, Cholesterol 12 mg, Sodium 117 mg, Carbohydrate 24 g, Fiber 1 g, Protein 4 g.
This entry was posted on 4:58 PM and is filed under Bread Machine . You can follow any responses to this entry through the RSS 2.0 feed. You can leave a response, or trackback from your own site.